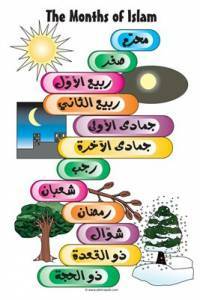 The Islamic calendar is a lunar calendar consists of twelve months in a year and 354 days. There are either 29 or 30 days each month, but they are not in order. It is also called as Muslim calendar or Hijri calendar. Islamic festivals or the holidays are celebrated according to the Islamic calendar. The traditional practice is, festival dates are decided and declared by a committee of Muslim leaders in the local country. This practice is followed in the majority of Muslim countries. Muslim leaders follow the process of the first sighting of the crescent moon after sunset to decide the first day of each month and then festivals are derived from there. The 12 months of the Islamic Calendar, in order are these. The Islamic Calendar | Muslim Calendar | Hijri Calendar | Lunar Calendar | Islami Mahino Ke Naam: - Islamic Months Name In Urdu, Islamic Months Names In English, Islamic Months Names In Arabic, Islamic Months Names In Hindi - इस्लामी महीनो के नाम हिंदी में And Other More Languages.